To the gentlemen reading, don’t be fooled by the pink, I dedicate a paragraph below to you as some of the products cater specifically to men! As anyone would, I took to google to conduct a search on local bath product companies and Pink Soapworks caught my eye! I touched base with the lovely owners, Lori and Kristin, and next thing you know I was chatting over coffee with them! A line of natural and homemade bath and beauty products based right here in Ottawa. Goat Milk Soaps, bath bombs, deodorant, lip balms, body butter and much more. See the Pink Soapworks Catalogue to view them all! For gentleman, you can find beer soap (contains real Belgium Citrus Beer), beard oil and don’t forget bath salts to sooth those strong and aching muscles too! This business started out of the blue when Kristin and Lori, who were only colleagues at the time, both took an interest in soap-making classes! Both owners continue to develop new bath and body items and carry signature items around various holidays! On top of using natural ingredients they try to use as many locally sourced ones as possible! Such as the honey, Sunflower oil and Apple products that are produced at nearby farms. I was so excited when I received the box, I took a moment to read about each product and set everything up to enjoy them in the following weeks! Bath time…. 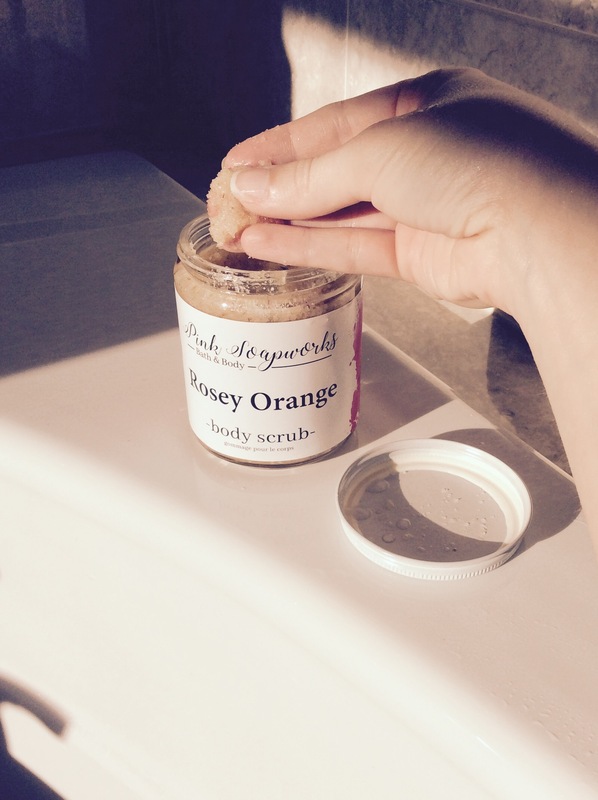 I used the Rosey Orange Body Scrub in my bath every two/three days. Instructions: Rub the product onto your skin, in a circular motion, and rinse. My skin felt so soft and a tad bit oily, and I had no dry skin on my legs. The orange/floral scent was really nice and fresh, other scents are available too! I think spacing the use of scrubs is ideal to avoid irritation if your skin is sensitive and also means your product will last longer! 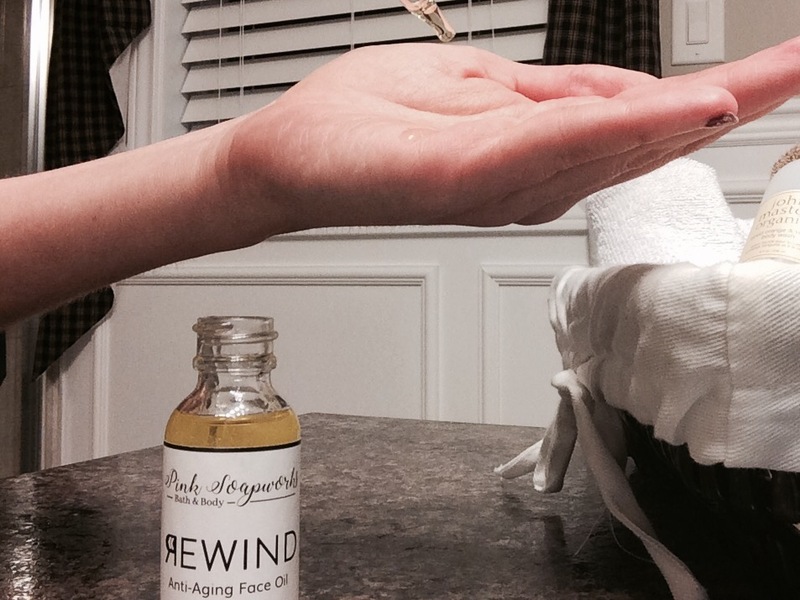 As for the Rewind Aging Face oil, I’ve been using it every night! Instructions: After cleaning your face, you only need two or three tiny drops on your hands and you gently apply it to your skin. I have a combination of dry and oily skin and I was nervous about applying oil! I hardly ever use creams or moisturizer on my face because the shiny look is definitely not for me. Turns out, this product doesn’t make your skin look oily at all, just helps moisturize! Oh and the smell is incredibly soothing. I didn’t think I would like this product and turns out…… I LOOOVE IT! 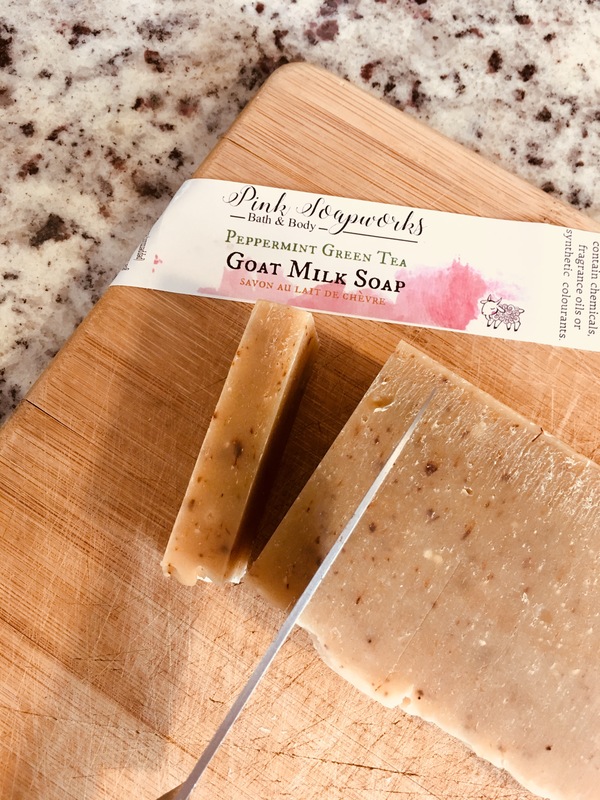 As for the soaps, I used the Peppermint Green Tea Goat milk mostly in the morning as it’s a more vibrant scent and applied the Apple Cider Goat Milk Soap bar at night! The soaps lather well and do no irritate your skin at all. You can also use the Apple Cider soap as a shampoo bar, which makes it a versatile product perfect for traveling! Soap tip: You can increase the lifespan of your soap bar by slicing it in smaller pieces. Simply run hot water on your knife, dry you knife and slice your soap into pieces. Products are available online by shipping (free with $100 purchase), by pick-up at two locations in Ottawa (no additional fee) and at multiple retail locations. Pink Soapworks bath and body items make a fun, useful and natural Christmas gift or stocking stuffer for your friends, family and even colleagues. For gift baskets or specific requests for yourself even, simply contact Lori and Kristin as they will be happy to personalize your order or gift! You can feel great knowing that your purchase also helped support a local Ottawa business that is run by two wonderfully dedicated and caring women! Stay tuned – I will be hosting a giveaway with Pink Soapworks products within the next weeks!